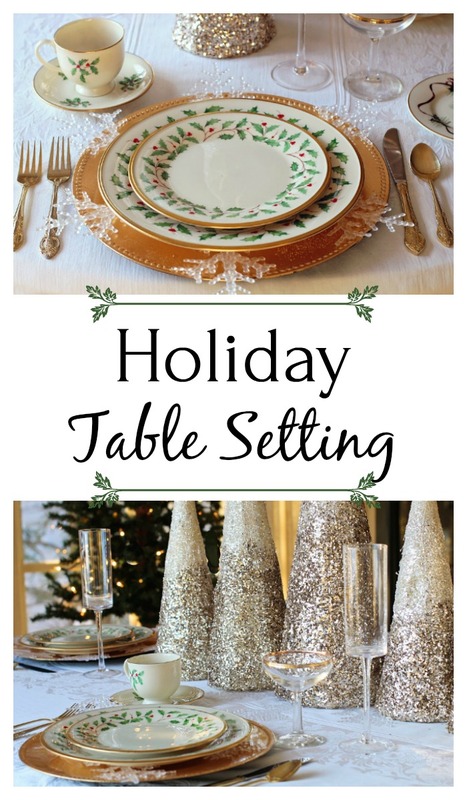 Avoid last minute holiday stress by planning your Christmas table setting ahead of time. I’ve collected several ideas to inspire you and get your wheels turning. Whether you prefer a simple holiday table, or a more elaborate setting, you’re sure to find something here that suits your fancy. When in doubt, turn to traditional holiday decor like red and green in plaid prints. 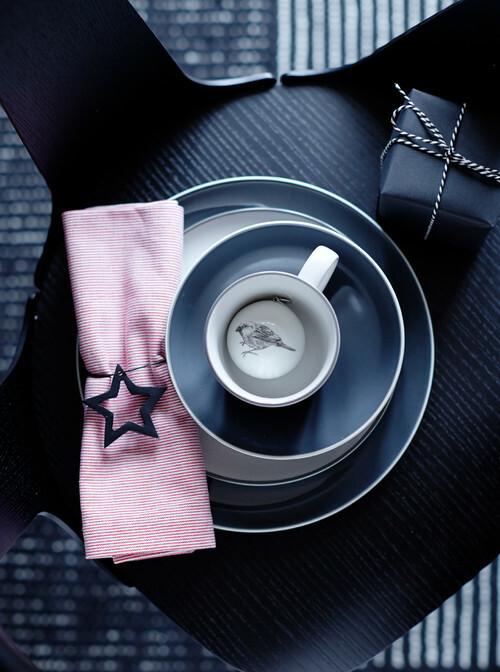 Note the clever details like candles in coffee mugs and small presents on each plate wrapped in plaid wrapping paper. White is a safe choice for dinnerware because it goes with absolutely everything. Here, a fun pair of candy-striped candlesticks flank a pretty flower arrangement to create a festive centerpiece. 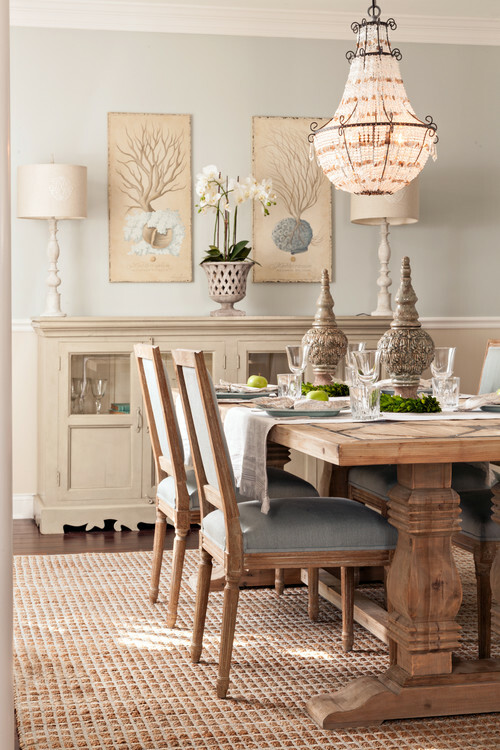 For those of you who have a beautiful chandelier, let it take center stage by keeping your table setting simple. 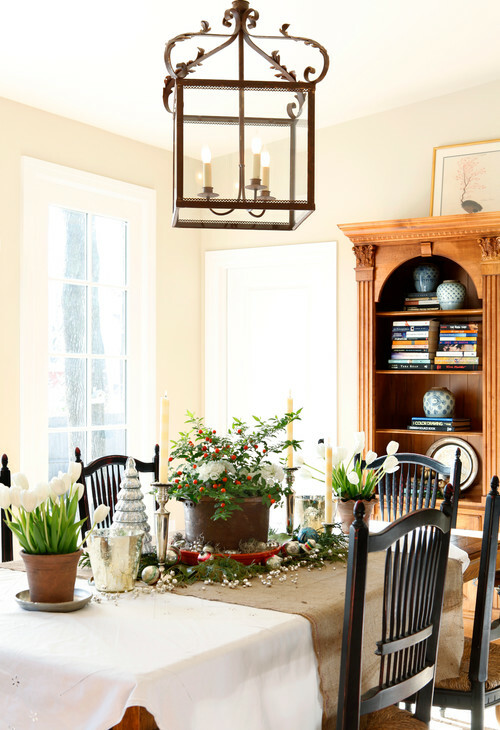 Two architectural pieces get a holiday touch with simple boxwood wreaths placed at their base. Pair black candlesticks with white dinnerware to create a Fixer Upper style tablescape that would make Joanna Gaines proud. A couple sprigs of evergreens in water and a few shiny baubles complete the look. 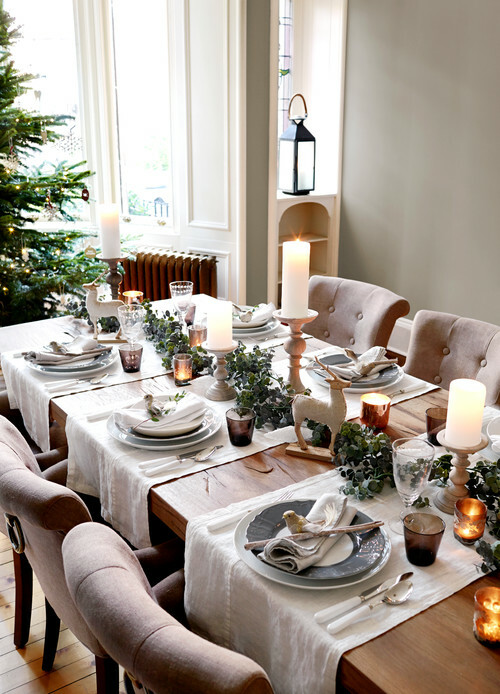 Tufted dining chairs lend a bit of elegance to a farmhouse Christmas table setting with antlers and a wooden white star creating an interesting centerpiece. 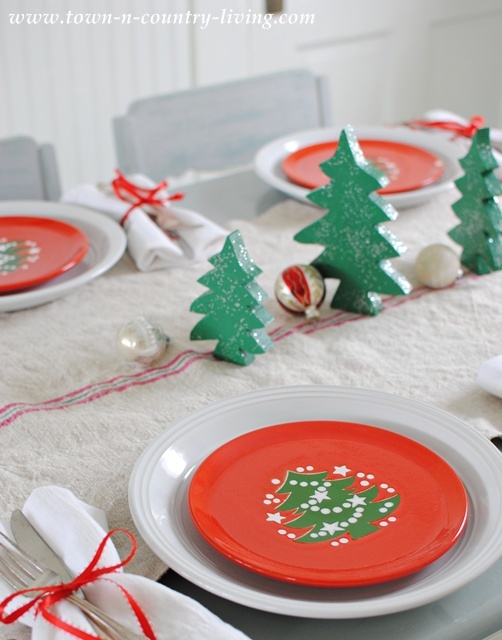 Mix greens with ornaments to create a festive table runner. Tuck a holiday plant in a vintage crock for an easy-to-create centerpiece. 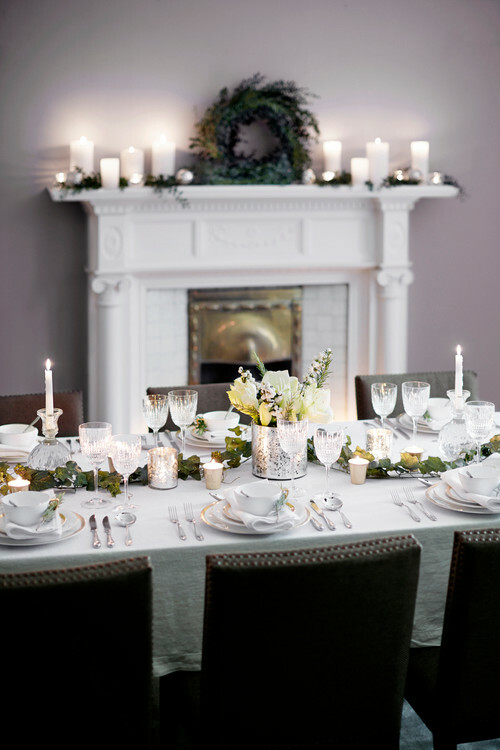 Simple white tulips add a feminine touch at either end of the Christmas table setting. 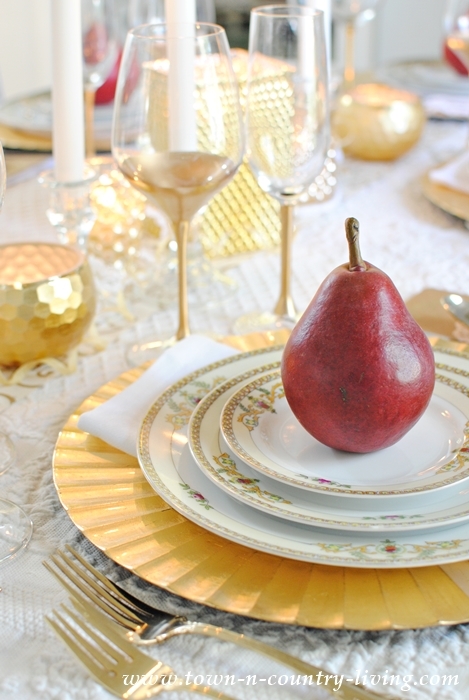 If you prefer an elegant table setting, use crystal glasses, silver and gold candle holders, and gold-trimmed plates to entertain your guests. Candles and votives on a nearby vintage (and gorgeous) mantel enhance the elegant theme. 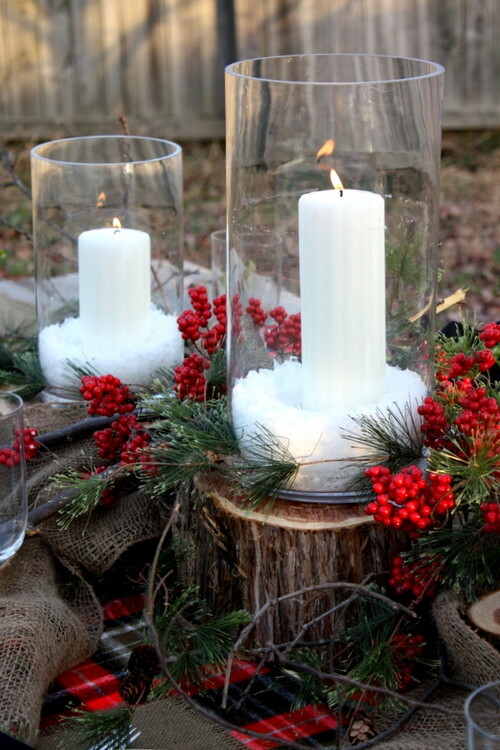 Create a rustic Christmas table setting by placing white candles inside large glass holders. Pour a cupful of sugar inside to create the look of snow. Tree slices nestled inside burlap ribbon provides texture while red berries add holiday color. 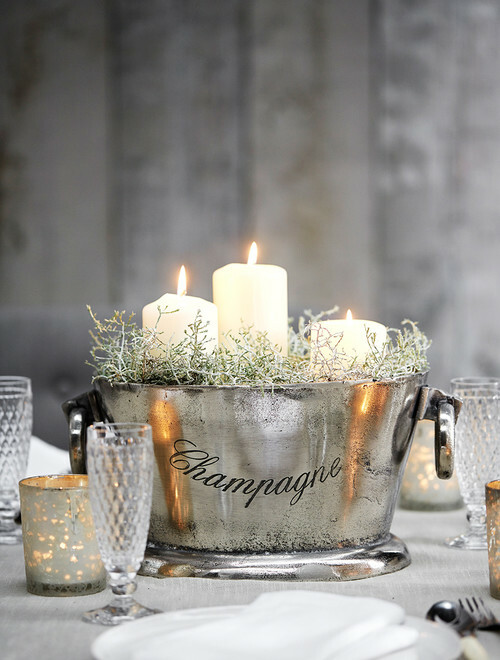 A champagne bucket is a unique candle holder. 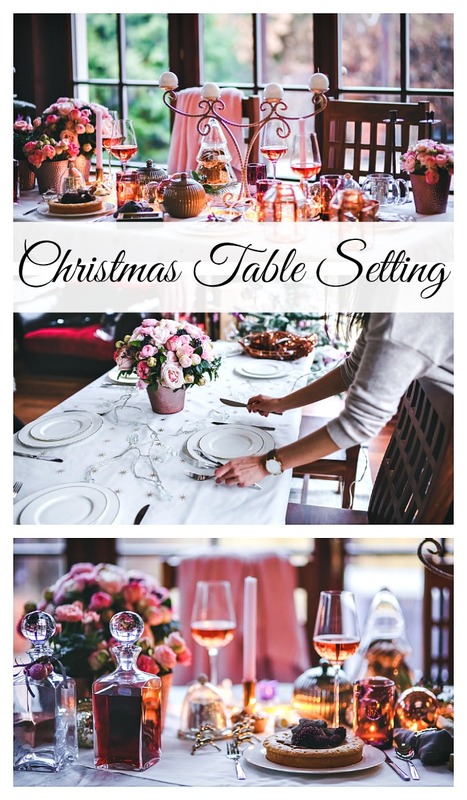 Shop your house to find items that might make a unique starting point for your Christmas table setting. 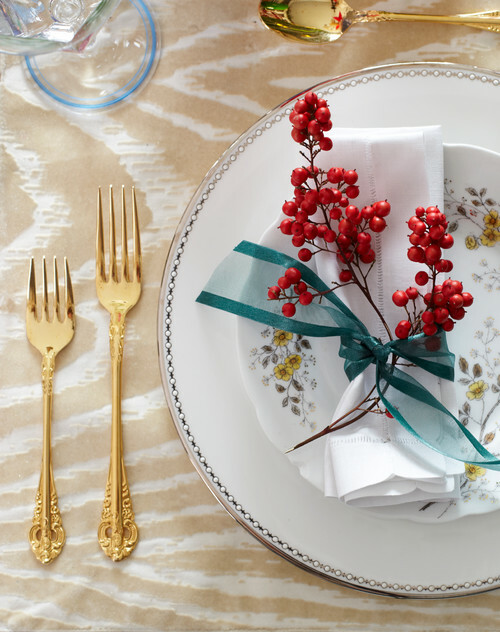 Don’t be afraid to mix patterns on your holiday table. Keep things simple by using baker’s twine in lieu of fancy napkin rings and place an evergreen sprig at each place setting to enhance the holiday scene. Consider using three table runners placed across the shorter length of your table as opposed to laying a single runner down the center of your table. The table runners now serve double-duty as place mats. Candles and greens are all that’s needed to create cozy appeal. 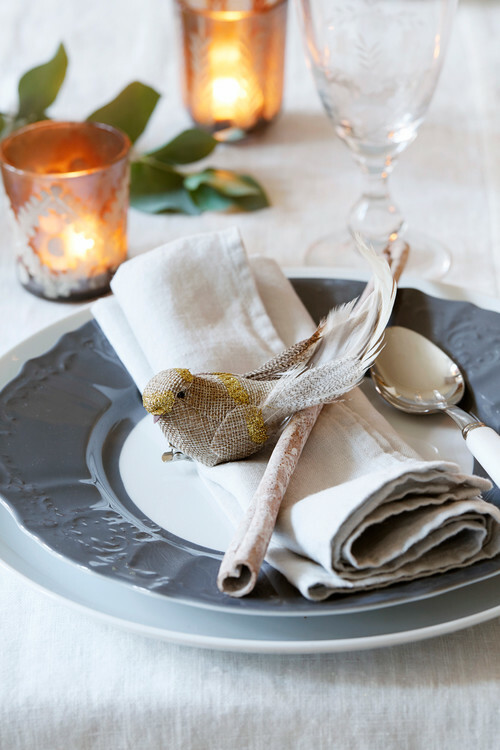 Place a clip-on bird ornament at each guest’s place setting. It looks pretty and each guest can take their bird home to decorate the Christmas tree. They’ll remember your dinner party for years to come each time they display their bird on the tree. 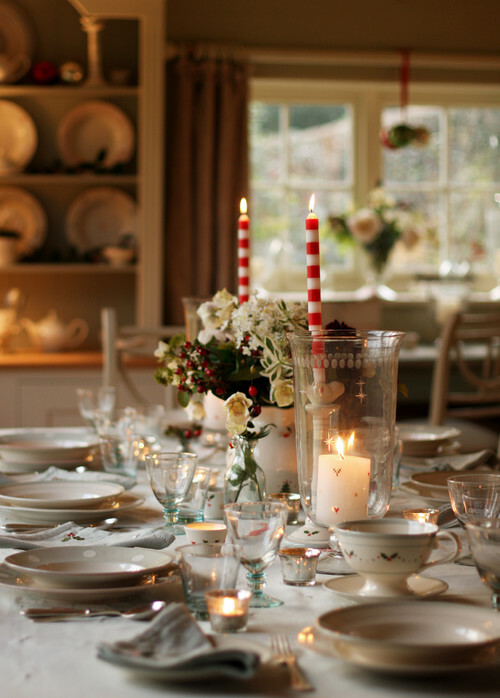 A sure-fire way to reduce holiday stress is to set your table the day before your Christmas gathering. You’ll be busy in the kitchen and setting the table is one less thing you’ll need to worry about. Don’t like to fuss too much with your table? Place a couple of small Christmas trees in a basket or serving tray and you’ve got an easy centerpiece. Gold flatware is making a big comeback. If you don’t have any on hand, you can find nice sets on eBay. 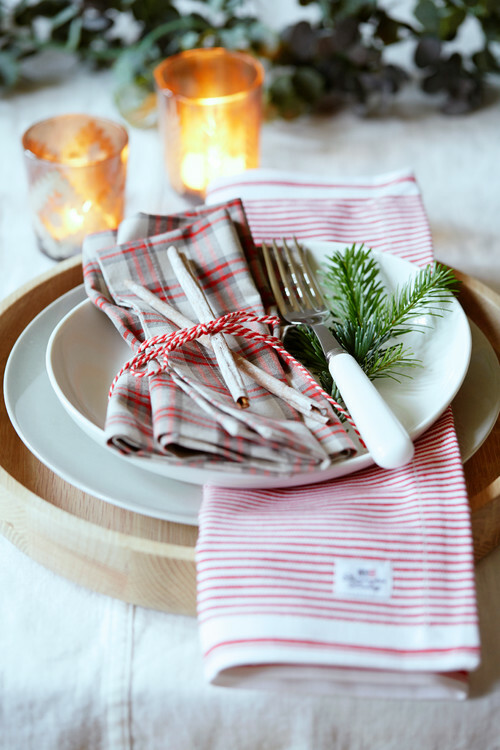 Tie a ribbon around your napkins and tuck red berries inside for a quick and festive look. Here’s my gilded table setting from last year. I paired gold with a bit of red. I didn’t have gold stemware so painted the stems of my water and wine glasses with gold acrylic paint. You can find small gold votive holders at low prices – or paint your glass votives with gold acrylic paint or embellish them with gold leaf. 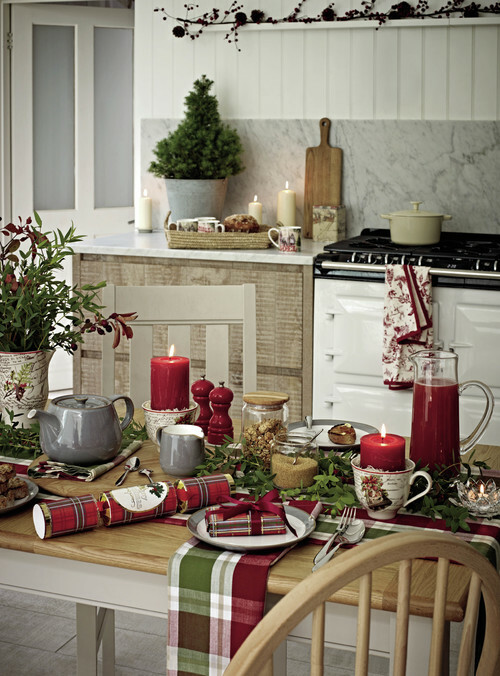 For a traditional Christmas table setting, choose dinnerware with a holly border. You can hand it down to your children as a family heirloom. I still have my mother’s Waechtersbach holiday dinnerware from my farmhouse Christmas tour and will someday hand it down to one of my children. 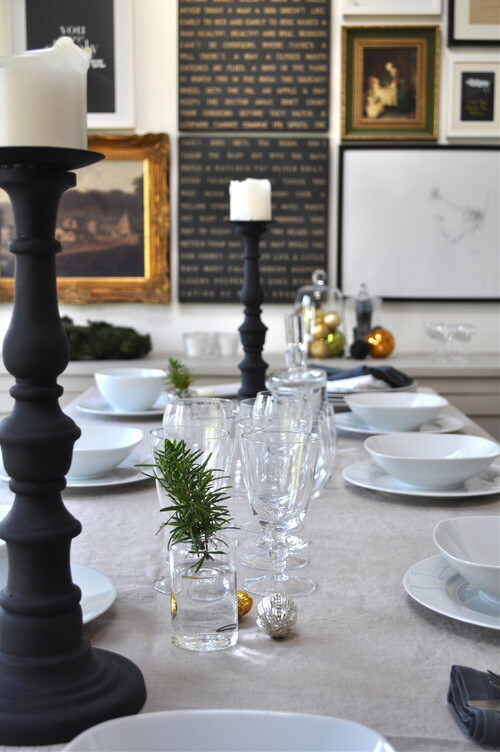 Try a contemporary look at your holiday table by using darker colors. A red and white striped napkin adds holiday cheer, along with a bird ornament tucked inside each coffee cup. I love the sweet simplicity of this place setting. 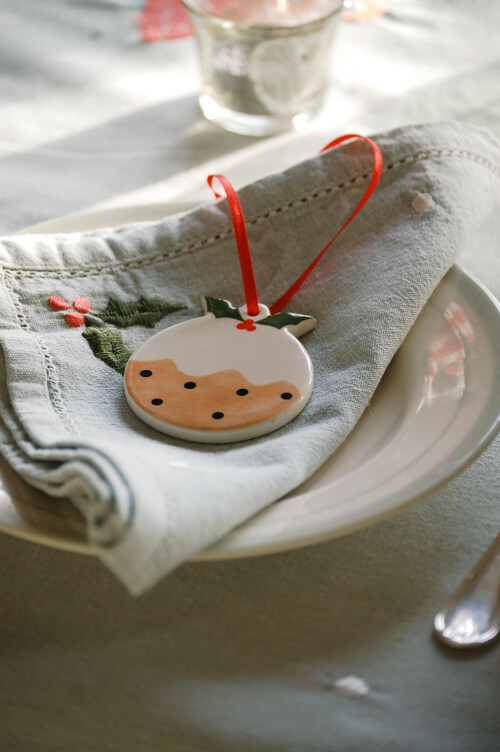 A linen napkin embroidered with holly cradles a pretty ornament. 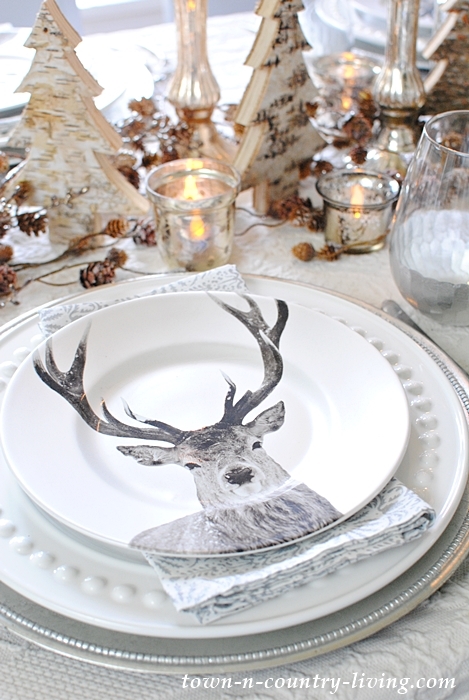 Last year I found deer plates and used them as inspiration to create a forest-themed Christmas table setting. 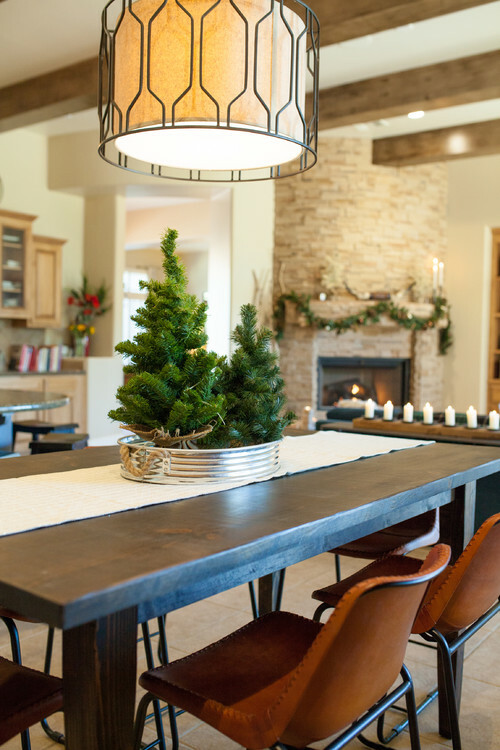 I hope you’ve found some inspiration for your holiday table! I’ll be sharing my official Christmas tablescape in a couple of weeks on November 29th. I’m excited to share it with you! Epson Salts make cheap good looking snow as well. Can be used later in a bath! Such a great plethora of tablescape ideas! I got some great ideas, thanks Jennifer you never let me down always giving me ideas. I love the more simpler ones and your mom’s dishes. 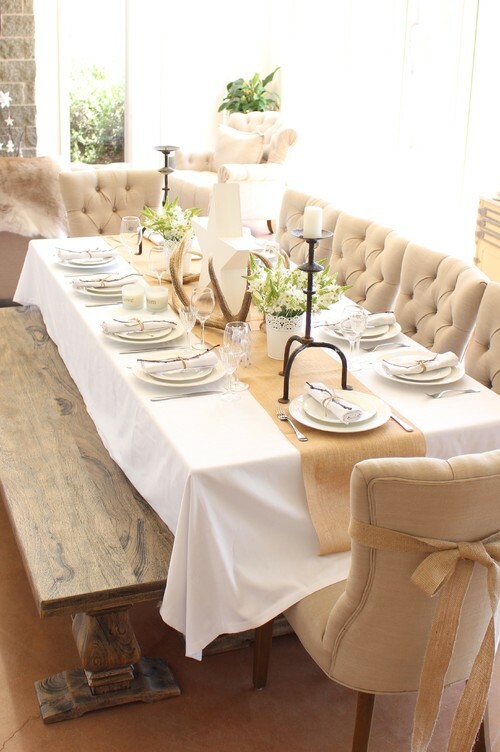 Lovely ideas – I’m always drawn to the rustic, outdoorsy ones with lots of natural elements. Thank you for the beautiful round-up!